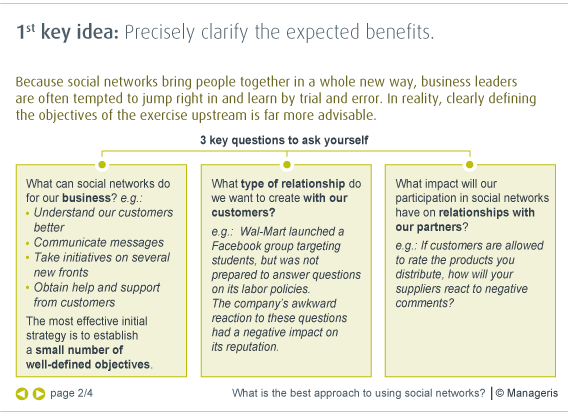 What is the best approach to using social networks? Social networks open marketing opportunities. How to fully tap the potential value of these new prospects? A lot of stories are going around about the power of social networks on the Internet. For example, MyBarackObama.com made it possible to rally a million and half volunteers who organized 150,000 events and collected $639 million in support of Barack Obama’s presidential campaign. Since launching the Nikeplus site offering a customized tool for amateur runners to monitor their training regimen, Nike saw its share of the running shoe market leap from 48% to 61%! Visa also considerably expanded its small business audience by capitalizing on social networks. 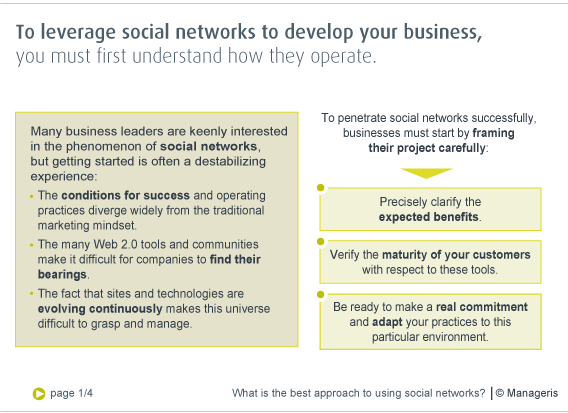 However, despite some notable success stories, businesses often have great difficulty tapping into the power of social networks. Indeed, a McKinsey Quarterly survey revealed very mixed feedback on these experiences. Only 21% of the surveyed companies said they are happy with the Web 2.0 tools they use, while 22% said they are clearly dissatisfied, and 7% were so put off that they stopped investing in this arena altogether. Even the most successful ventures in this field, such as Facebook, have experienced some major disappointments. – Before getting started, carefully define what you want to accomplish. Launching blindly into this unfamiliar and fast-moving universe is inviting disappointment. – Consider the maturity of your customers with these tools. Don’t make general assumptions based on the way Internet users are creating new links with other companies on the web, but instead focus on how your customers are willing to use the Internet to interact with you. – Make sure you are ready to play by the rules. In on-line social networks, companies must interact with people in ways that diverge widely from their customary marketing practices. Businesses that are not sufficiently cognizant of this fact may find that their Web 2.0 initiatives leave Internet users indifferent, or even worse, offend them, triggering a boycott! An overview of today’s social networks and the changes they trigger. How the intangible economy questions the rules of our economic landscape. 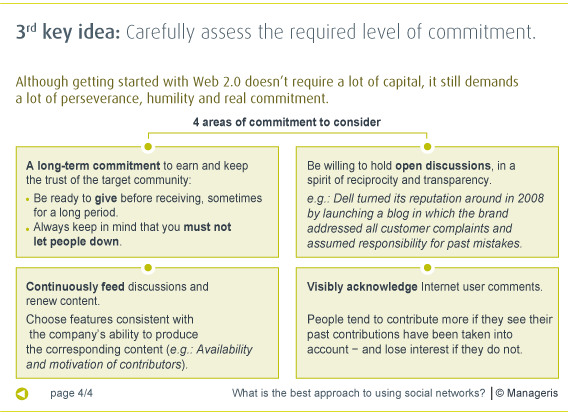 How to take advantage of Web 2.0 to build new relationships with your customers. 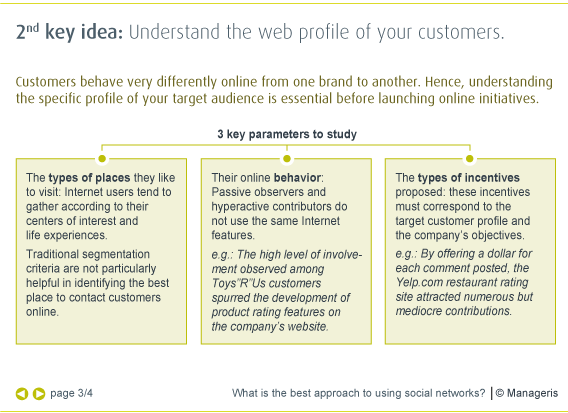 Make the most of the new consumer behaviors induced by the social networks’ emergence.